There has been much press coverage about how the Saleh regime in Yemen is facing important security challenges. There is the Houthi rebellion in the north of the country which has been going on since 2004 (see a brief, excellent analysis by Gregory Johnsen). There is the growing movement to restore the independence of South Yemen (which April Longley Alley and Abdul Ghani al-Iryani have written about). And there is an Al Qaeda presence in Yemen which has been widely reported on, though it appears (as Johnsen has pointed out) to be far less of a threat to the Saleh regime than either the Houthis or the southern secessionists. A fourth threat is one that Alley pointed out in her 2008 Georgetown University Ph.D. dissertation, “Shifting Light in the Qamariyya: The Reinvention of Patronage Networks in Contemporary Yemen”: the fracturing of the alliance between the Saleh clan on the one hand and the Al Ahmar clan on the other. Abdallah Al Ahmar, chief sheikh of the Hashid, helped Saleh come to power in 1978, and strongly supported Saleh for almost three decades thereafter. With Saleh increasingly working to ensure that the presidency is transferred to his own son, Ahmad, President Saleh has, as Alley pointed out, increasingly marginalized Abdallah’s son, Hamid—who retaliated by actively supporting Saleh’s electoral rival in 2006 (see Chapter V of her dissertation). Sheikh Abdallah again sided with Saleh on this occasion, but his passing away at the end of 2007 means that he is no longer present to manage the rivalry between his sons and nephews on the one hand and Saleh and his kin on the other with regard to the succession or any other issue. Needless to say, a growing rift within the ranks of the regime’s top elite will not help it in dealing with security challenges from opposition forces. There is also an international dimension to the crises in Yemen. As has been widely reported recently, Saudi forces have joined the fight against Houthi rebels near the Saudi-Yemeni border. Riyadh is helping Saleh in this instance, but it must not be forgotten that Saudi-Yemeni relations have often been tense. Under Saleh, tension arose between the two governments when Sanaa sided with Saddam Hussein during the 1990-91 Gulf crisis and when Riyadh sided with the southern secessionists in the 1994 Yemeni civil war (which Saleh’s forces won). Saudi-Yemeni relations have improved greatly since the two governments signed a border agreement in 2000. If, however, Riyadh concludes that Yemen is fracturing, it will undoubtedly seek allies to support there—perhaps including the southern secessionists whom they backed over a decade ago. Recent Yemeni government statements that Iran has been helping the Houthis have raised alarm in many quarters. The Houthis are indeed Shi’ites, but belong to the Zaidi sect and not the Twelver sect predominant in Iran (indeed, the two sects have historically been rivals). Many Western sources (including the Washington Post) have mistakenly portrayed the Houthi conflict as a Shi’ite rebellion against a Sunni government. 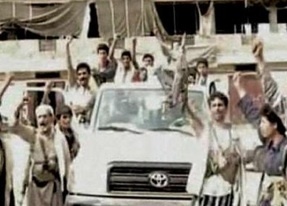 But as Johnsen pointed out, “Saleh and numerous other leading figures of contemporary Yemen are of Zaidi origin.” Iran has denied that it is involved in this struggle, and the Houthis have declared that the Saleh government is falsely claiming that Tehran is supporting them in order to get support from America, Saudi Arabia, and other GCC countries for himself. As Johnsen further noted, the Yemeni government “has yet to provide any firm evidence of direct Iranian support.” Indeed, up until October 2009, Yemeni-Iranian relations appeared to be quite good. Even since then, Tehran has called for a peaceful resolution of the conflict, warning outside powers to stay out. The Saudis, though, insist that Iran is involved. It is not clear whether they really believe this or are simply going along with Yemeni government claims in order to obtain a larger role inside Yemen—something that Sanaa has traditionally resisted, but now appears to welcome. Interestingly, Al Qaeda in the Arabian Peninsula leader Muhammad Abd al-Rahman al-Rashid also recently claimed (on Al Jazeera, November 10) that “Persian Iran” is supporting the Houthis (among others). As with previous conflicts within and between the two Yemens before unification in 1990 and the 1994 civil war, the current conflicts inside Yemen have local causes. But as with previous conflicts, these Yemeni conflicts have international ramifications and could draw in other actors. Saudi Arabia is already involved. If Iran is not yet involved, it could be. The same is true, of course, for the United States. So what are the goals of the various protagonists in Yemen? The Houthis want to restore the Zaidi Imamate that ruled North Yemen between the departure of the Ottomans at the end of the First World War and the 1962 North Yemeni “revolution.” Presumably, they also want to rule over South Yemen—which, though ruled by the British until 1967, was claimed by the Imamate. The South, though, is overwhelmingly Sunni. If anything, the Southerners have even less desire to be ruled by a Shi’a Imamate in Sanaa than by the Saleh regime. Al Qaeda does not appear strong enough to come to power in Yemen, but it may be satisfied with a chronic state of conflict there that provides it with maximum freedom to launch attacks against Saudi Arabia and other countries. The Al Ahmars may see the growth of any or all of these opposition movements as further proof (as if they needed it) that the Saleh regime can no longer govern Yemen effectively, and to use their considerable resources to displace it. Saleh and his kin, of course, simply want to suppress all opposition and remain in power. And what are the possible outcomes to the current conflicts? One is that the Houthis take power in the North and the secessionists restore the independence of the South. This would lead to a situation somewhat similar to the 1967-90 period when there were two Yemeni states. As then, the two are likely to have hostile relations and to seek external assistance from rival great powers (or even not so great powers) against each other. Another is that Yemen will descend into chaos, with none of the various actors strong enough to defeat all the others nor weak enough to be completely defeated either. In this scenario, all the various Yemeni protagonists are likely to seek external assistance. And to a greater or lesser degree, all might receive it. A variation on this theme is that Yemen will come to resemble Somalia—another country which was previously divided, then united, but then became divided again. As in Somalia, the more populous region (the South in Somalia; the North in Yemen) could descend into a prolonged state of chaos while the formerly British-ruled portion (the North in Somalia; the South in Yemen) could emerge as a relatively coherent—albeit impoverished—state. Unlike Somaliland (North Somalia), which the West has largely shunned in deference to the African Union, Saudi Arabia and Oman might well recognize a re-emergent South Yemen (or South Arabia, as the British referred to it), thus easing the way for the West and other Arab states to do so. Finally—and seemingly against all odds—Saleh might prevail over his adversaries. He has, after all, a track record of doing just this through a combination of co-opting many while at the same time playing them off against each other, and enlisting allies (both foreign and domestic) to isolate and defeat still others. Saleh has always played a poor hand well. The example of Syria also shows that it is possible for a father to successfully transfer power to a son in an Arab republic. But as the prospectuses of mutual funds warn: past performance is no guarantee of future results. Whatever its future, the period ahead for Yemen is likely to be, to paraphrase Hobbes, “nasty and brutish.” This nasty and brutish period, though, is not likely to be short.